Local drivers know the importance of excellent traction on wet, icy, and mud-covered roads. 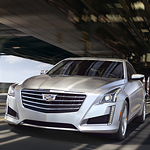 The CTS offers four-wheel drive and magnetic ride control. These systems improve traction and automatically adjust the steering and handling to the road surface conditions. At Lithia Auto Stores, we look forward to demonstrating the latest advanced performance technology on the CTS. We invite you to drop by and take a test drive. You can experience the power, controls, and acceleration of the 2018 Cadillac CTS first-hand. Please call for an appointment or stop by today.